9845 - Sweater and Dress using Folksong Chunky Leaflet with designs for a Sweater and Dress using Sirdar Folksong Chunky. 9846 - V Neck Sweater and Shawl Collared Cardigan using Folksong Chunky Leaflet with designs for a V Neck Sweater and Shawl Collared Cardigan using Sirdar Folksong Chunky. 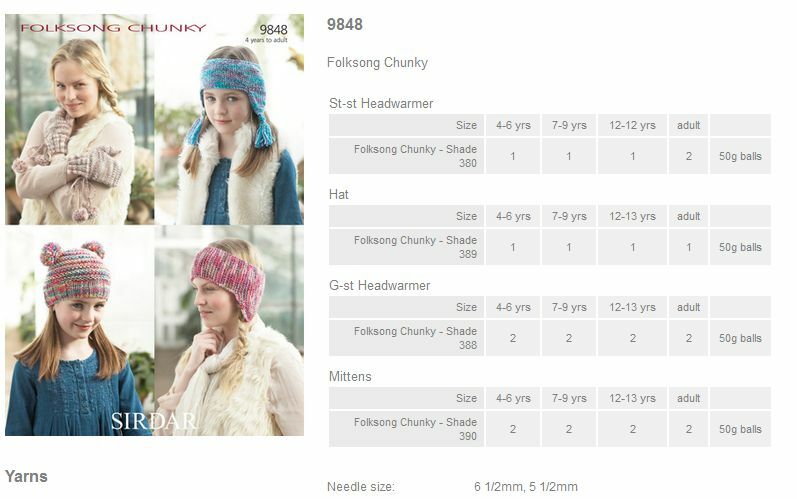 9848 - Headwarmers, Hat and Mittens using Folksong Chunky Leaflet with designs for Headwarmers, Hat and Mittens using Sirdar Folksong Chunky.